A D.C. Council member whose campaign account is missing money revealed that more than $113,000 was stolen from the fund. When Council member Michael Brown discovered the missing money in June, he fired his campaign treasurer and reported the theft to police. His former treasurer has not been charged. According to a statement released by Brown's campaign, a preliminary audit revealed 33 unexplained expenditures in the name of Hakim Sutton, the committee treasurer. 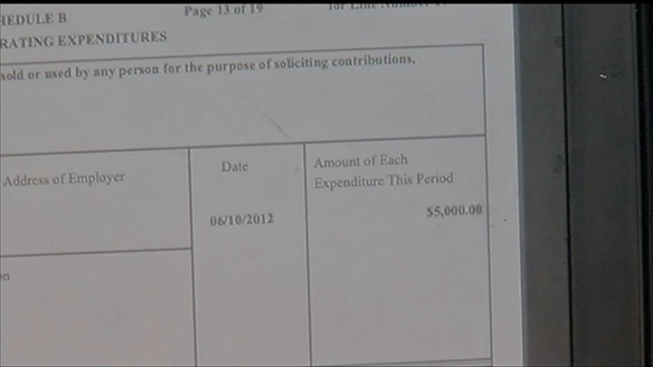 News4 found multiple expenditures called unexplained expenses ranging from several hundred dollars to $5,000 to Hakim Sutton on a report filed with the office of campaign finance. Brown said he wants the person responsible for the theft to be prosecuted. “We are confident that the target of this investigation will be arrested, prosecuted and convicted because of all the information we’ve provided to police,” Brown said. The theft left Brown's war chest almost bare. He now has about $18,000 cash on hand for his November bid to keep his at-large council seat. Brown did collect enough signatures to appear on the November ballot, according to the D.C. Board of Elections. His opponents had challenged the authenticity of some names on his petition. “Yesterday the board formally rejected the challenge and dismissed the allegations of any wrongdoing whatsoever,” Brown said.